I thought I would do a little history of Know Your Meme because there isn’t a good one out there. I had written one up before on the Know Your Meme website, but it got deleted. In the Fall of 2007, Know Your Meme started one day in a moment. At the time, Joanne Colan was the anchor of Rocketboom, I was selecting the content, writing the scripts and producing the show (and running the business) Joe Bonacci was editing, Kenyatta Cheese was organizing company operations (the editing department in particular), Jamie Wilkinson was the lead dev and Elspeth Rountree was my administrative assistant. It was an awesome time because we all loved what we were doing and everyone was sincere. Not that it matters probably to anyone except me, for a bit of context, I was the only “Founder” of Rocketboom and the only “Founder” of Know Your Meme and in complete control of all creative and business decisions as I had hired everyone, Rocketboom was 100% my investment and business (everyone else was paid an excellent salary with benefits), and there were never any board members. There was also never a single person involved in Rocketboom or Know Your Meme who accepted any risk, or would care enough to work on it without getting paid a large amount (except for Joanne who really stands out as the person who was always there because she believed in our mission), or who would stick with it and help keep it afloat through times of trial. This would never change until I sold 100% of my share to Cheezburger outright last year. Having created and founded the site, and then after working so hard to a enable it and make it popular, I had already moved on mentally to working on other things I felt were also important to establish. Anyway! One day in early August 2007, Kenyatta and I were deeply involved in discussing Rocketboom’s video content. It was a formal meeting with just the two of us and we were discussing creative ideas for topics and writing. With the exception of Joanne at times, no one else at the company discussed production concepts. I wrote all the scripts at home myself without consulting with anyone at the office so whenever I could tap people for ideas, I would do it. After Joanne, Kenyatta was a regular go-to when looking for extra script ideas. Having noticed that some of the “segments” I had been doing were working, I wanted to find some more segments to do inside of the Rocketboom show. A segment happens in the middle of a news episode where it suddenly breaks into a reoccurring theme that is predictable and formulaic, but then breaks out and back into the normal episode. From a writing standpoint, it’s a crutch to lean on when time is running out and you need to deliver a script. From the audience perspective, it’s a welcome return to something familiar. From a business standpoint, it’s a great way to spin off a new show. Since pretty much every other word out of our mouths those days was “meme”, Kenyatta turned to me and blurted out “Know Your Meme!”, and then proceeded to provide context for the history of “Know Your _[fill in the blank]____”, especially with regards to World War II propaganda. When I heard it, my mind raced in a million directions and I knew within moments that this was the trigger I was looking for – it was a perfect “brand” mechanism to explicate memes. As we were developing the idea further, Kenyatta also brought up the idea of the white lab coat and by this point, boom, I added it to my list of script segment ideas I would develop. On September 4th, I sat down to write the very first Know Your Meme segment into a Rocketboom episode. Joanne was wearing a white lab coat, I directed and shot, and Joe edited. At the time, Kenyatta was focused on shaping up the editing department as our operating officer and took over the edit from Joe at the end of the night to help polish it up, and then I directed Kenyatta’s edits to completion. Hello and good Tuesday September 4th, 2007. Im Joanne and this is Rocketboom. Its great to be back. Lets get right to the news. Miss Teen USA video on YouTube reaches 12million hits in one week, quickly working its way into the most viewed you tube videos of all time. As far as we know, this may be the quickest any video has shot up this high. Predecessors took many months to accomplish what Miss Teen USA has in just a few days. Why has this video become so popular? this video is for real! behind, George Bush was in Iraq yesterday on a surprise visit to convince troops that they not only needed to be there, but that we need to keep them there and find some more people to join them. As I mentioned, for me, Know Your Meme was all about explicating memes and establishing a vocabulary. You can see that even in the first segment, there was an air of presumption that this was not actually the first segment, in the way it assumes the audience already knows the vocabulary and the scene. Something else had occurred to me as well. Rocketboom needed a place to aggregate these explicated memes and our audience might contribute. While there were a number of other comprehensive sites that would collect the source videos for memes, there wasn’t a good site out there for documenting the whys and wherefores. And a lot of memes were not video based. To me, this was always the most exciting aspect of Know Your Meme. Once you understand how content goes viral, by studying IRL case examples, that knowledge becomes powerful and valuable. So that night while the episode was being edited, I decided to install a Know Your Meme wiki onto rocketboom.com envisioning a ‘wikipedia for memes’, so to speak, but one that our audience at Rocketboom would understand enough to kick into gear. One that cited sources that Wikipedia would not consider authoritative. One that was completely and utterly free and open. I used to write on my blog and speak at conferences a lot about the power of collaborating with wikis. I then put up a few meme terms on the wiki and wrote up a few pages for starters and linked to the wiki from that day’s episode on Rocketboom. The segment felt right, the wiki got a bit of action and so I decided to write another one. On September 16th, I wrote a Leave Britney Spears Alone reaction video segment and Joe edited. Bonus cameo by Steve Garfield that day. this gentleman has made his way into the #8 spot on YouTube for Most Discussed video of all time with over 1300 video responses and over 9 thousand comments. The video uses techniques of absurdity and sympathy in way that seem real enough to actually be absurd and sympathetic. Having now established a name, a style, costumes and props, a theme, intro graphics, a wiki site, produced segments, a plan for ten episodes and a purchased domain name, you could say Kenyatta and myself were the co-creators of the Know Your Meme show and that I was the creator of the meme database. And then Christmas was coming on. Kenyatta and I had several meetings to discuss content for the upcoming Christmas holiday. I was *completely* exhausted because I had not had a single vacation for literally 3 full years so the plan was to pre-program two weeks of content and have everyone take a break at once. Since I knew in order to accomplish this I would need to write 10 scripts, I went right to my crutch when the idea dawned on me that the Know Your Meme segments are ready for the next step, to become full-blown episodes and that it would be relatively easy (and a lot of fun) to do and so that’s what I decided I would do. So Kenyatta spoke to Joanne to get her up to speed about it and on November 21st, Kenyatta informed the rest of the crew of what we were doing in order to seek input on which memes to cover because we knew everyone at the office would have big opinions on this. Ellie’s first contribution to Know Your Meme suggested we look at other videos of people talking about the year in memes to get some ideas. Jamie sent us all a link to a playlist of videos he had been collecting on YouTube. I took everyone’s suggestions for which memes to cover, decided on the list and started cracking on the writing. As I mentioned, though Jamie and Ellie had not been involved in any way in the production process at Rocketboom before, it was an obviously good idea to try having them as on-camera “meme experts” or “scientists” to fill in for Joanne and everyone agreed to lend a hand, despite the crunch we were all under to get our other work done. After I realized it would be impossible to get all of the scripts done alone, especially while continuing to write scripts for the daily show and acting as CEO, etc. etc., Kenyatta got Ellie and Jamie to pitch in with some script writing. This is the initial list of memes I decided on. Otherwise known as Adam Nyere Bahner, Tay Zonday came into fame overnight on You-Tube with his own video hit single, Chocolate Rain. The question for us follows, why did this video hit count go insane? Think back to the first time you experienced the Tay Zonday video. He had such a young, childish face and his voice was just so… low. Many of us stopped to ask, “Is that really that guy’s voice? How could he go so low? Is it even physically possible? And so we got sucked in. We analyzed the video for authenticity, fidelity, uniformity, viscosity – we tested the lip to audio sync propensity at variable bit rates as well as searched for inconstancies in interpolation and interlacing. The video is real. [passionately->] Yet it was the question – the investigation itself – which led so many to look more closely. And thats when, Bingo! – level two sinks in. As Tay Zonday looks away to take a breath, he suddenly takes himself out of the video at hand and puts himself into our shoes. It happens, in a way, teasing us even further into searching for the authenticity of the video because we know now that even HE is questioning his own authority symbolically. Supporting the environmental predisposition for natural memage, by the time we concluded that the video was authentic… and that the low voice in the recording was true… we were already hooked. Its a one chord, repetitious stuck-in-your-head sensation. This is no one hit wonder, this is a true talent that made its way naturally through the system, a true value of internet meme quality. Forever a part of the year 2007. Here are the scripts for the meme episodes. Currently, the info is all there and I wanted to send it over to you now before it got any later, but this is a terrible representation of the overall vision for each episode as well as the whole thing. So today/tonight I will draft up a complete, beginning-to-end, detailed script of everything, including directions for assets, etc for each script, order for episodes, etc. Im available to discuss anything anytime today so feel free to call, I can clarify anything you need to know in the meantime. The next day I sent the updated notes and the episodes turned out to be a great success and everyone got a nice break. By the end of the holiday, however, the wiki at http://knowyourmeme.com had turned into a real battlefield. I dreamed of a wiki that could remain open and had left the registration settings such that anyone could come in anonymously to create new meme entries and update old ones. I thought somehow removing the barrier to entry would work, like the Open Constitution Wiki, but it didn’t. Every time I turned around, someone would deface the wiki just to have fun and mess it up. I constantly had to go in and revert content and then soon, I added a login feature. As you can imagine, that was a weak fence. Though Jamie began to appear in some more episodes, his best contribution IMO was eventually building out a new Know Your Meme wiki styled database from scratch. We continued to use my wiki for about a year until we finally released the new Know Your Meme site. Greg Leuch was also critical to the buildout. As the lead designer of the site, Greg should get a lot more credit than he has ever gotten in the press for his input and his ability to design in code. As the site began to take shape on the backend, Chris Menning who also never gets enough credit was in charge of populating articles. I had hired Chris as my first assistant writer for Rocketboom and assigned him to help write entries for the database. Aside from Chris and myself, no one else at Rocketboom paid any attention to the wiki until after it was a pretty big hit. In order to get it there, Chris and I endured a tumultuous relationship because I was so controlling and demanding over the writing but we grew and grew together and Chris continues to do a great service to internet culture. Establishing the right academic voice for the meme entries was crucial. Not too long ago there was some confusion over who wrote the "first database entries”. Though Jamie’s name is stamped on them, it’s because he was the one who set up the database and thus was the first user that everything went under when he imported entries from the year-old wiki. Chris was actually the one that wrote the bulk of the first articles based on what we could salvage from the best entries we had written on the wiki, and anew. The voice of the articles was critical because this is what would guide others when creating their own articles. I insisted it be extra academic along the lines of the episodes while Chris injected many crucial style elements as well. Over the next year, Kenyatta would slowly take over the production of the Know Your Meme show and the others would slowly begin to collaborate more on scripts. I still maintained control over the topics and would write many scripts, taking them all in to finalize, along with signing-off on each edit, but saw Kenyatta as my way out and on to running Magma. I’ll never forget the day (over a year later) I announced to the team that I was handing over creative control of the Know Your Meme video production to Kenyatta. That meant Kenyatta would no longer need my sign-off on anything from ideas to publishing. This had never happened at Rocketboom before with any department. Eventually, I decided I would name Kenyatta CEO of Know Your Meme but he abandoned it short of that time. Since I had mostly handed off Know Your Meme by the end of 2010, it left me with quite a load on my shoulders suddenly, along with Rocketboom. After fixing the operations and training a new team, so that it remained tuned for just a fraction of the cost, I was solicited by Cheezburger and sold last year. Though I no longer participate much there, I still love Know Your Meme and I’m glad it’s able to keep doing its thing. The current staff of KYM which I hired, organized and negotiated employment for at Cheezburger has my heart for pulling together and stepping up to the plate to help keep Know Your Meme alive and looking good. That includes especially Brad and Don. When I was in the process of selling and trying to assess it’s long term value, I wondered if it would one day fade. Of course Cheezburger or future owners could affect it in any way they want, but IMO, all things being equal, it will continue to remain an important resource for years to come, perhaps following a steady and enduring upward path, much like the incline seen over the past decade for the wonderful Urban Dictionary. From everything I’ve learned, the best advice I can give to anyone at this point is simply to study how memes happen. Once you do, your voice will become empowered. 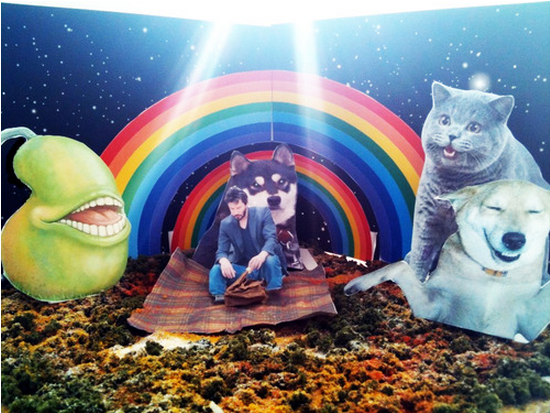 * Image Credits: Top: Know Your Meme; A picture of an IRL cut-out diorama made by Brad Kim. Bottom: Urlesque; Myself with the Know Your Meme team from the first ever Hollowmeme party put on by Rocketboom & AOL, October 2009.